I want to love the search apps in Yahoo’s newly opened Search Gallery. I really do. Opening up its search engine to outside developers is an idea worth applauding (although it could still do more). That’s why I was excited when Yahoo announced its SearchMonkey platform, which essentially allows outside developers to create their own search “applications” that changes the display of search results. Today, Yahoo publicly launched a gallery of these apps, which Yahoo members can add as customizations to Yahoo search. Some of these include apps that are supposed to highlight public LinkedIn profiles, Yelp reviews, Epicurious recipes, Digg stats, and music info from Last.fm. When you perform a related search, a little icon and customized detail information is supposed to appear within the search results. Think of these as Firefox search add-ons, but all in one place. Well, that’s the idea. But after putting some of these enhancements through a quick test drive this morning, I am completely underwhelmed. The following searches failed to produce any enhanced results: “fried snapper,” “baked ziti,” “U2” (got the regular Yahoo Music shortcut, but not any Last.fm results), “Rolling Stones” (same). “White Stripes” (same), several current headlines on Digg (nothing). The LinkedIn app seemed to work okay for famous tech CEOS like “Reid Hoffman” and “Max Levchin,” but it didn’t prioritize the LinkedIn results in any way. For Levchin it was No. 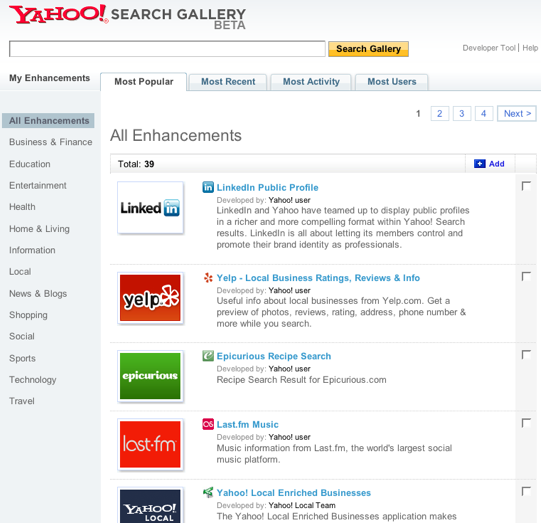 6, even though I told Yahoo by adding the LinkedIn enhancement that I want to see those results. But SearchMonkey only lets developers change the display, not the order of the results. So it kind of works, but you shouldn’t have to hunt and peck to find these enhanced results. And you’d think that the more specific your search query, the more likely you are to find one. But the reverse is true. I’m not sure if this is Yahoo’s fault or the fault of the developers. What I do know is that SearchMonkey apps have along way to go before they create a better search experience.